The everyday need for a buttonhook began in the early 19th century when it was used to fasten still leather button-boots. By the 1880's, lines of buttons had become fashionable on ladies' gloves, clothing and footwear, and the development of the feminine market encouraged the production of "fashion buttonhooks" in a wide variety of sizes, shapes, and materials. 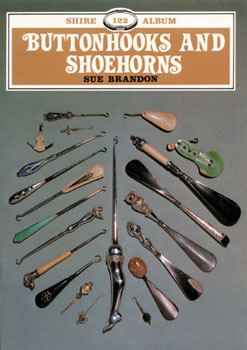 This books describes these buttonhooks which can still be found by collectors today. It features sections on advertising and patents, buttons and shoehorns today, shoehorns or shoelifts, and more. It also includes numerous detailed black & white photos, which combined with the descriptive text makes for a valuable guide for any collector or reader.